Kathy and I took a trip down to REI yesterday. I was looking to get a few things to start filling out my biking wardrobe. I'm not willing to get into the whole spandex side of things, but there's only so many times you can wear board shorts and a t-shirt, and on the few cooler days we've had I've started to notice my lack of options. My priority right now is figuring out a good options for pants to ride in. Again, I'm not into the whole spandex bit, so I guess my fashion choices would tend more toward messenger style apparel. Maybe just pants cut a bit short, though breathability might be nice. But yesterday I instead bought two shirts: the Lightweight MTS Long-Sleeve Crew in "Cavern Red" and the REI Swift Long-Sleeve T-Shirt in "Sharkskin/Dijon". Both are fast-drying and fairly thin long-sleeves that I think will be good for those SoCal days where it's warm during the day but a little cool in the evening. If you've been reading the blog for a while, you might remember that I signed up for Flexcar in February. I last used the service back in April, when rate hikes made the service less affordable. I still think the car-sharing idea is a good one, however, so I was very interested today to see in the Council referral email a motion by Eric Garcetti talking about creating a one-year pilot program in Hollywood (PDF). Reading the motion text, though, it would seem the City's involvement would largely be in providing some visible parking. And they would then turn around and charge the companies a fee for upkeep of the sites. The only part that seems incentivized is the concept of dedicated on-street spots. The motion asks DOT to report back in 30 days about the possibility of creating the pilot. Before that clock starts, though, the motion goes to the Council's Transportation Committee and then back to the full Council. Eventually, though, this could be a cool idea. 1127348791: Denied by PostHook: Domain known as spammer. PostHooks code is now in place. The domain lookup and a very minimal spammer banned words list are registered and running. I bought my bike computer on July 19th. So that means I've had it basically for two months. Functionally it's a little less since I was in Michigan for a week, so we'll say I've had it for eight weeks. The odometer on the computer reads 356.2 miles. That averages out to about 44 miles per week, which is a good bit less than I'd like to be doing. A major part of that has been the transition to being back in school instead of working every day; I'm riding more days, but it's more like 7 mile days than 20 mile days. I really need to find more time for some recreational riding. There are plenty of trips that would be cool to take; I just haven't had time lately. I've found out lately that there are any number of things you can do to crash a Sony Ericsson s710a. For instance, you can go into the pictures and use 'Select Multiple' to choose like twenty pictures you want to delete, while at the same time listening to mp3s. Or you can be listening to music and try to attach four or five images to an email. Maybe the phone's just trying to tell me it's not a computer. I've been doing some backend eThreads work lately in preparation for again changing up my spam blocking solution. I'm fed up with false positives in lists like the DSBL (a dynamic IP that had an open SOCKS proxy in 2003 likely doesn't now). Heavy handed blocking has made my stats a lot cleaner, but it's also led to legit people getting blocked and spam's starting to sneak around anyway. I wanted to put this code into eThreads as plugins and keep the core code cleaner, but to do so I needed a way for plugins to hook into the posting process. That's now in the code, so it's time for the actual plugin development. Hopefully I'll have that up and going within the next few days. All of this has made me realize that someday I should release a new version. eThreads 1.2 came out in 2000. The whole codebase has been torn down, rewritten, torn down, and rewritten again since then. My laptop battery appears to be giving up on life. It properly runs from 100% to 50% or so, and then just instantly drops to 2% capacity. So basically I'm getting just a bit over an hour out of it. Very odd. I've got another one back at the apartment. I may have to switch it in. Yesterday USC opened its 2005 home football schedule at the Coliseum against Arkansas. The game itself was a blow-out; USC won 70-17. That makes 24 straight victories, and 22 straight at home. So on my way to Long Beach this morning I got a ticket. It was an MTA Sheriff's officer (I guess... the ticket has MTA on it), and I was on my bike pulling into the San Pedro Blue Line station. In high school they had "Computers" classes where they taught you how to use things like Word and Excel. I never took those classes. I did "independent study computers" and built the school web site. But tonight some of that might have come in useful. I've been trying to make some charts in gnumeric, to lay out financial info for tomorrow's DLANC meeting. I've successfully figured out how to make the charts, but it would appear that gnumeric has zero support for choosing sensible colors that will show up in grayscale. Does Excel handle that better? How hard can it be to have a "I'm printing in grayscale option" in the properties that alters the behaviour of the code that picks colors? I was able to manually set bar elements to different gray levels, but pie charts appear to only let you say "Automatic", in which case half of what it picks just shows up as white when run through my laser printer. I refuse to touch Open Office's oocalc app. I've messed with it before and despise its UI much as I do that of OO's word processor. I also installed kchart (can't find a working website for that one) and couldn't handle (or understand) the UI. gnumeric feels very nice, but pie charts where half the elements come out white aren't very useful to me. Word of advice: Don't leave your dhcpd.conf file in an unusable state when your server is running headless. A power outage can make it quite a pain to get things back up and running. I have to say that I was very pleased with my lunch on Saturday. I don't cook very often, but this is one of those meals I can make fairly quickly and without a ton of mess to clean up. 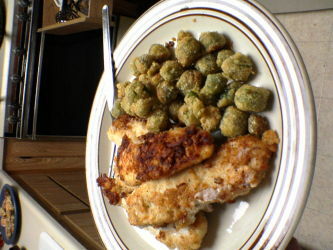 The fried okra is just store-bought frozen stuff that I dump into oil. So nothing special there, but I like it. The chicken is from frozen boneless breasts that I defrost a bit and then slice into strips. Then I lay down some aluminum foil (for mess containment) and pour some flour onto it. Into that I dump a healthy portion of McCormick Spicy Montreal Steak Seasoning. Mix it around a little, then roll the chicken in it, and throw it in the pan. Just a little bit later you've got a nice little lunch, and leftovers.